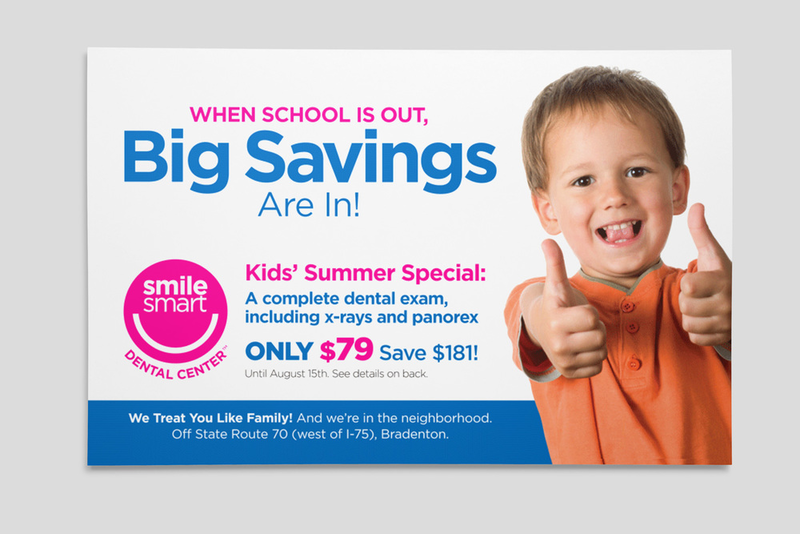 Smile Smart is a dental office located in busy shopping plaza in Bradenton Florida. To stand out and attract busy moms and families in this retail environment, DesignPartner gave Smile Smart a bold, fun, friendly look that appeals even to kids. Smile Smart Dental. Partner Since 2010. Smile Smart Dental Center is a family dental office and dental assisting school located in a busy shopping plaza in Bradenton, Florida. To stand out and attract busy moms and families in this retail environment, DesignPartner gave Smile Smart a bold, fun, friendly look that appeals—even to kids. Bright colors, smiling faces, and clean uncluttered communication all reinforce the friendly personality of Smile Smart.